photot-eye is pleased to announce the newest addition to the Photographers Showcase -- Daniel Traub and his portfolio Lots. Though he now splits his time between New York and Shanghai, Daniel Traub grew up in Philadelphia. Traub's mother, Lily Yeh, founded The Village of Arts and Humanities in North Philadelphia, and through this community organization Traub experienced a unique and inmate view of the neighborhood. 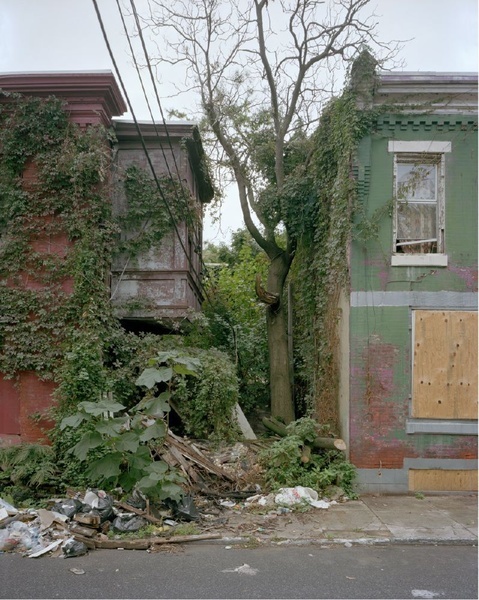 It is a view that makes his images of the city especially compelling, as he has returned to document the decaying neighborhoods of the inner-city. 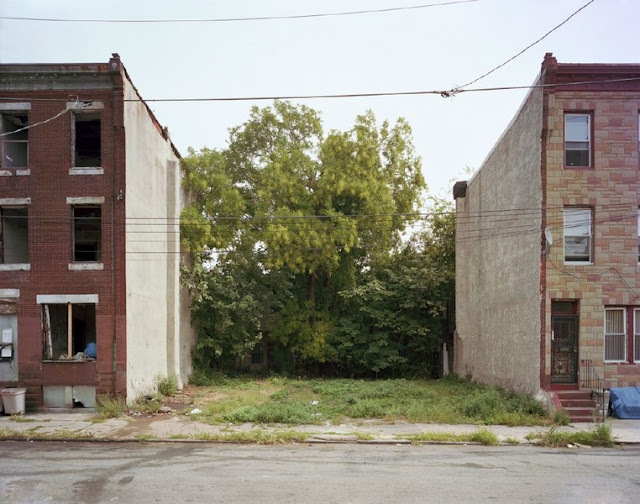 Lots is Traub's typological study of Philadelphia, images of vacant lots sandwiched between buildings, in the process of being reclaimed by nature. Traub has approached this subject with care, apparently remaining committed to certain compositional rules: all photographs reveal a horizon or sky, the frame is always divided into thirds where the outer two sides show existing structures while from the center spring organic life. One of the most compelling elements in Traub’s work is the duality between the existence of man and the spaces that nature has reclaimed. Because the photographs are weighted in thirds, the eye tends to try to dissect each aspect individually. Examining the outer structures, I feel a bit like an anthropologist, hunting for clues through the debris and rubble of lives once lived in what are now broken and abandoned homes. But as my eyes scan through the remains they settle and begin to explore the open and “abandoned” space; land that has been reclaimed by nature. The empty lots are like missing teeth in the smile of the city -- gaps where infrastructure has failed, and nature takes over. Despite the fact that these landscapes have been realized through poverty and neglect, it is difficult to avoid the beauty of plant life growing to fill the empty spaces. It is this aspect that makes Traub’s work a celebration; the city is teeming with life, the plants providing a metaphor and glimmer of hope for the urban spaces could be. 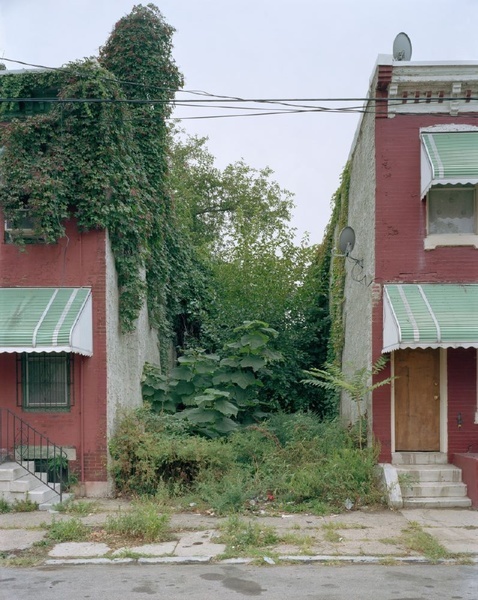 I grew up in a tidy Philly row house when the blue collar was somewhat respected. The “missing teeth” are the bad dentition of the forsaken working class. The city jungle sumac, other flora and fauna usurps the lives and dreams of the once backbone of a fading empire. This is not a celebration unless you think rats’ nets and cockroach colonies are a triumph. I can about smell these photographs.